Does your BI system make you happy? Today many organizations find accessing and making good use of their SAP® ERP business intelligence a challenge. 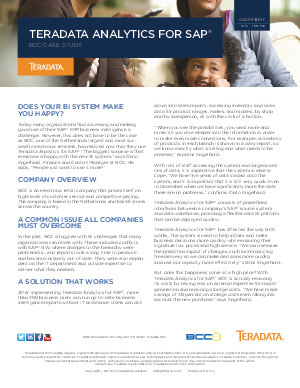 However, this does not have to be the case as BCC, one of the Netherlands largest and most successful electronic retailers, has realized now that they use Teradata Analytics for SAP®. A solution that works. Download now!